Set on an island beyond the easternmost exit arch of the Vadem Causeway, Utesh can only be reached by boat or flier. From a distance the city resembles one vast pyramid shimmering in the white coastal light. But in fact there is no pyramid in the whole city: the buildings are arranged in a grid with the smallest at the perimeter rising to the central tower called the Sky Axis wherein are the dual thrones of the Ward of the Red Crown and the Ward of the White Crown. Thus the overall form of all the buildings sketches out a pyramid, ensuring that the cosmic energy collected by the Sky Axis is properly focused and conveyed to all the inhabitants. The city is built of golden stone, the buildings comprising broad spire-topped towers (shaped like Cleopatra's needle) or square arched colonnades. Often the tops of columns are carved to resemble stylized sea fronds, for the Uteshi believe themselves descended from the merfolk who dwell on the ocean bed. Murals commonly depict the city's bird- and animal-headed gods, or replicate in stylized form the all seeing Eye of Horus that stares from the summit of the Sky Axis. To the west, on the mainland, is the necropolis. Here the tombs are pyramid-shaped, again the aim being to focus cosmic forces so as to preserve the bodies that lie within. like ministries, in theory comprising two factions whose heads (and supreme priests of the temples of that faction) are the Wards of the White and Red Crowns. In practice, byzantine intrigues and alliances blur the simple factionalism of the system. People: The Uteshi average slightly over six feet and are of slender build. Faces are typically high-cheekboned, eyes almost feline, jaw sharp, skin tawny olive-gold. Hair is white or very pale fawn. However, men usually shave their heads but may have long sideburns or small straight beards; women keep their hair very short except for Mohican-style crests. Culture: More important than monetary wealth in Utesh is neth - literally, "eye". A man's degree of neth shows how well respected he is. Nobles are born with more neth than commoners, citizens have more than foreigners. Certain professions (notably the priesthood) carry more neth than others. You can earn more by good manners, poise, learning and heroism. Neth is used up like spiritual currency - in return for favors from the gods, and to balance against any wrongdoing that might otherwise result in imprisonment, torture or death. Tamo Anchan is set atop a granite plateau above a sweeping jungle. Much of the city is built of a dark blue stone, which in the case of the noblemen's palaces is inlaid with rectangular gold plaques. The major buildings stand on pyramidal platforms, with high stairways simulating the city’s own position above the Tershen forest, and have tall Mansard-roofs, often adorned with "horns" along the ridge. Arches are corbeled or trefoil. Wide esplanades open from the streets around the perimeter of the city, the parapets of which overlook the jungle. Throughout the city are parks planted with bright green moss. Here and there can be seen the ivy-twined stela which depict the rulers of ancient times and, in hieroglyphics, relate the great deeds they accomplished. To the north is the great Lake of Stars, down towards which is directed a giant viewing scope. This device, left over from ancient times, monitors the pattern of stars in the lake (which do not mirror the stars above) and represents them as a three-dimensional matrix in the tower that supports the scope. The Anchan priests believe the lake is a portal through to another place, perhaps the underside of the world, and that the stars shown there have a sacred influence on their dream lives, just as the stars above affect their waking lives. Government: The city's king is called the Deodand. He is appointed by a council of high priests and clan-chiefs, who take advice from astrologers. As long as his rule goes well, the Deodand enjoys the luxurious comforts of a god on Earth. But in times of trouble he must be sacrificed, the theory being that his soul can then go to plead the city's case in the Court of the Gods. From this custom derives the euphemism, "He has been sent to petition the gods," said of anyone dying violently or unexpectedly. The clans of Tamo Anchan are: the Blood Ritual Clan, the Celestial Beast Clan, the Ceraunic Beast Clan, the Serpent Guide Clan, the Clan of the Vision Quest, the Axis Tree Clan, the Bird of Time Clan, the Manta's Spine Clan, the Fruiting Body Clan, and the Jade Skull Clan. Highly trusted individuals can be appointed Ahau, or "bannermen", by the clan-chief. Bannermen have special status. There are very severe penalties for a non-bannerman (of any clan) who insults or harms a bannerman, regardless of circumstances. People: Anchans tend to be shorter than average (5'5") but nonetheless sturdily built. Noses are slightly flattened, eyes oriental, full-lipped mouths; skin color is glossy ochre; hair blue-black. Hair is straight and worn long. Facial hair is uncommon. Clothing is often woven of flax or feathers from the jungle birds, dyed in brilliant colors and set off with fire opals and black pearls from the lake. Anchans set great store by personal bravery in battle. The highest honor to which a young warrior can aspire is to earn his place in one of the War Lodges, each dedicated to its own totem constellation or planet. 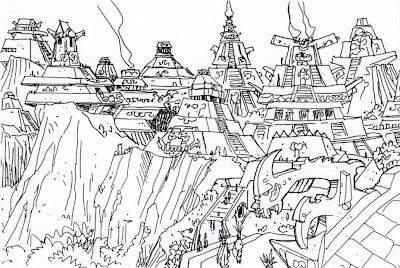 Eibon is built in the foothills of the Delenda Mountains, on the edge of the Akali Desert. Behind its battlements, the city rises on the swell of the three hills where it stands, its tall blockish buildings climbing in tiers. The biggest buildings are made of the reddish local stone, but this is hard to quarry and so most of the city is constructed of bricks made with lime and the crushed shells of sand-crabs which blaze like coral and diamond dust in the sun. In the heart of the city, the temple groves stand out like lakes of greenery. Their sacred gardens are always well-watered, despite the low rainfall. Public squares can be seen on different levels of the city, connected by the steep streets with frequent steps. Cutting across the city are three old walls half fallen to ruin: the walls that separated the old quarters of the city, now ransacked for their stone and closely clustered with the poorer dwellings. In places overgrown with flowers, in others blackened and widely streaked where refuse has been thrown down, these walls stand like weathered rock ridges across the city. On one hill, in the Byrsan quarter, can be seen a host of warlike monuments. Spiral pillars capped with bronze support the pediments of temples to Tirvecto, the local god of the desert's heart, patron deity of the Eibonites. On a lower hill is the teeming warren of the overcrowded Strangers' Quarter, given over to commerce; it is here that non-citizens have their homes. The bright cloths of the dyers' clans, stretched out on the rooftops, give this quarter the most color. Further back, against the mountainside, is the Megaran quarter with its high towers and curious obelisks like upturned cones. Here are found the temples of the universal gods, with their cylindrical minarets of iron that look like skeletal black chimneys. Above circle the sacred reptile-birds, grown fat on sacrifices. Government: The ruler of Eibon is called the True Man. This is not a hereditary position: the True Man is that lord whose heraldic badge is worn by the majority of the city's elders. If things go badly, if the city suffers poor harvests or reversals in war, the True Man may wake to find the badges have changed, his support evaporated. People: The Eibonites are average height, hook-nosed, swarthy brown in complexion with curly red, brown or black hair. Beards without moustaches are fashionable among men; women wear copious make-up and plait their hair up in elaborate styles. The common beast of burden in these parts is a kind of waddling long-nosed camel (related to Macrauchenia). For warfare, the Eibonites use the massive long-necked parvum (related to Indricotherium) that grazes on the trees and shrubs of the desert fringes. Built on high cliffs overlooking the sea, the white marble of Vertis is shown off to good effect in the magnificent towers, domes and colonnades. Lovers of theatre and art, the Vertides have filled their avenues with slender statues of exquisite beauty, and each day in the open-air theatre above the bay there are masked plays telling the heroic tragedies of ancient times, interspersed with musical interludes and comedies. But life is not mere leisure for the Vertides. They are keen philosophers, and devote much time to trying to recreate or even improve on the wonders of the past. 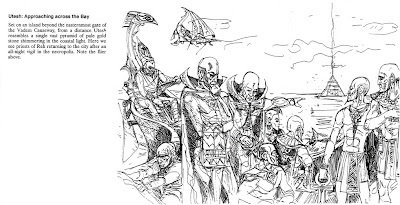 Not only is Vertis's navy the envy of all Abraxas, but they have a fleet of two dozen sky-boats armed with ion projectors which help to deter enemies from supposing these peace-loving philosophers would be an easy conquest. 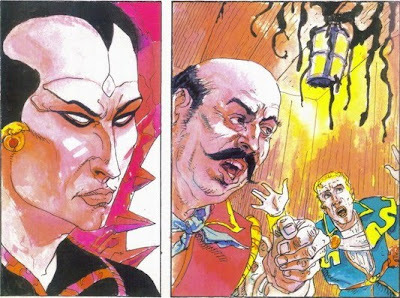 However, although as a people their grasp of ancient technology is impressive, the Vertides make poor individual sorcerers - perhaps because of some innate lack, perhaps only because their mind set is more directed towards logic than imagination. Government: Affairs of state are debated in the Senate, a council made up of Vertis's most prestigious citizens. People: The Vertides are average height, fair-skinned; hair is usually blond or brown, more rarely red or black, and wavy rather than curly. Long flowing beards are common in older men as a mark of wisdom. Clothing comprises tunics or togas, often clasped with silver, there being no gold mines near Vertis. 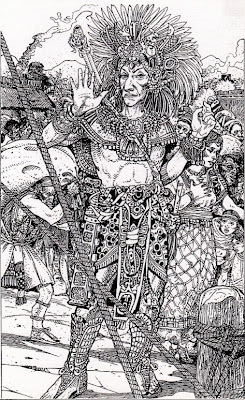 Abraxas is a lost continent from before the beginning of recorded history, which is destined to give rise to myths of sunken lands like Atlantis and Mu. Here advanced technology coexists with magic, primordial animals stalk the jungles, incredible civilizations flourish, and Mankind must share the planet with alien races from other worlds and planes of reality. The scan of Russ's map here hardly does justice to the almost luminous original, which is over a metre tall. The map shows how the inhabitants of Abraxas envisage their land. Its actual coastline, if you were to look down on it from space, would be recognizable enough to modern eyes to break the suspension of disbelief, which is why we keep it from the players. If we ever publish Abraxas as an RPG, however, that version of the map might find its way into the referee's book. There are five great city-states of Abraxas: Vertis, Utesh, Tamo Anchan, Eibon and Argistillum. The wide plazas and towering palaces of the cities indicate high refinement, in some cases even decadence. Nobles are carried in carved sedan chairs by their slaves to watch the death-duels in the arena. Fortunes are gambled and lost at great feasts. Assassination and intrigue decide who holds power. The cities are connected by the Vadem causeways designed by the great wizards of the still more distant past. On payment of a toll, the causeways allow rapid transit from one city gate to the next. Other relics of old science-sorcery still remain, lighting the streets with glowing posts at night or enabling the very rich to glide over the forest in sky-yachts when they care to go hunting. Some actinic lances survive from ancient times - weapons capable of hurling blasts of electric energy. But few now know how to recharge them, nor how to make the causeways function when they grow dim. What was once technology is now becoming, through ignorance and secrecy, a magic art. Each city has its own character. When Abraxas finally sinks (many millennia yet in the future though that is) some of its people will escape to create the civilizations of our own ancient history. 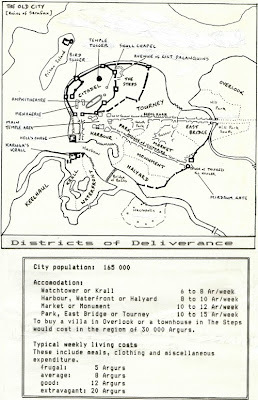 Thus the city of Tamo Anchan shows similarities with Maya and Olmec culture; the descendents of Eibon will become the Carthaginians and the Etruscans; Argistillum's survivors are fated to found Babylon; Vertis gives rise to the halcyon image of Greece and Troy; Utesh's beliefs and customs will live on in Ancient Egypt. For millennia the city-states of Abraxas have enjoyed peace, but now they are under attack by the Ulembi, ruthless aliens who come from a dying star cluster beyond the Coal Sack and are capable of psionically broadcasting their physical forms through outer space. The cities must put aside their rivalry and send champions to meet the menace before it is too late. Starting tomorrow and running for the better part of a month, we're going to be bringing you a wealth of development material from Abraxas, our MMOG that never got off the ground at Eidos Interactive but might yet appear in some other form - whether gamebooks or novels or comics we cannot yet say. Abraxas is the kind of science fantasy world of "ivory, apes and peacocks" more familiar to readers of Edgar Rice Burroughs and Robert E Howard than the muddier medieval milieu of Middle Earth, Warcraft, Warhammer, Dungeons & Dragons, Dungeon Siege, Torchlight, Guild Wars, The Witcher... Or indeed of Dragon Warriors, come to that, though DW fans will not need me to tell them that it's not quite in the same orcs-n-elves vein as those others. Hurl: skin dyed blue, you will be mistaken for a pureblood Uttakin. Hill: you learnt to dance a spectral minuet from ghosts in Tarshesh. Hatch: you killed or blinded the giant in his lair in Gigantus Mountains. Herbal: you are on the mission to rescue Princess Zobeida from the djinn, by order of the Caliph of Pethumar. Hemlock: you have rescued Zobeida and returned her to the Caliph; you are now on his second quest. Honour: on a mission for the Lord High Astrologer of the City of Stargazers to get a Kafiya bean. Hounds: you got a desert orchid for the sultan and were rewarded with an ability bonus. Hothouse: you got a Kafiya bean and gained a level. Iota: you committed some crime of which the kirin disapproves. Ink: you touched the saint on Thunder Peak (you can do it repeatedly). Judas: you slew a guest at your villa, thereby attracting the ire of the Kindly Ones. Kink: you did something wrong of which the kirin disapproves. One of the good things about reworking the books for e-readers is that we can have many more codewords, because the app will handle them instead of you having to. This should allow for a much richer experience with more factors affecting each quest outcome. The other useful thing to come out of searching out these codewords is that we've come across pretty extensive notes we made all those years ago covering the whole series. So if the e-gamebook versions take off, and build enough of a market to make the remaining six books viable, we have a lot of material now to work with. Abraxas starts on Sunday. Be here. 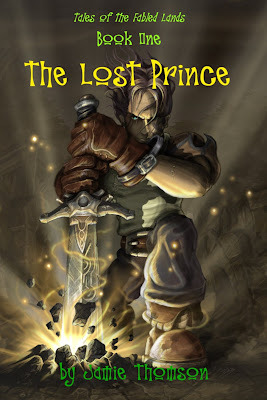 A special offer for St Paddy's Day: we're giving away the PDF version of Jamie's first FL novel The Lost Prince for free. Or you can buy the print copy if you don't have enough dead trees already. Both right here. 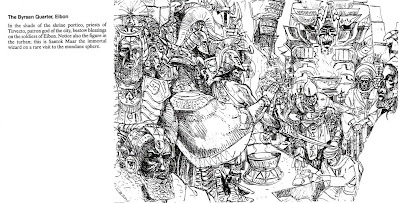 Another pic from the Fabled Lands books that shows how much Russ can pull off with just a few, apparently sketchy, pen-strokes. 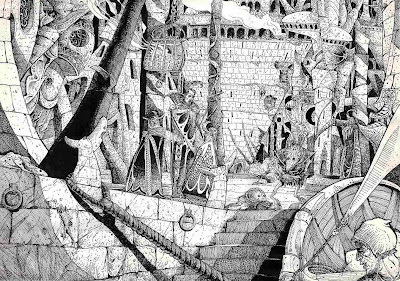 He can work in many different media, but it seems to me that the black-and-white line drawing is his métier. A brilliant illustration by Russ for one of my Virtual Reality gamebooks, Necklace of Skulls. He had to Tipp-Ex out the little girl's face in the background and redraw it because the art director said the original looked "too oriental". I had just returned from honeymoon in Mexico and Guatemala, where I had seen a lot of Mayan kids, and Russ's original drawing was in fact spot-on. The same art director on the same series made Russ redraw the Gargan sisters in Heart of Ice. He had them in army-style muscle t-shirts and she wanted them wearing something big and baggy. Which made no sense at all; they were hardbody soldiers and proud of it, not the sort to favor dungarees that gave them the outline of an old floor cushion. If we turn Heart of Ice into an e-gamebook, that'll be the first thing I fix. 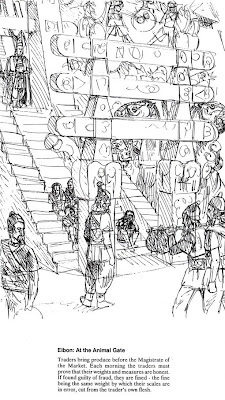 Coming up in the next eight weeks or so: the floodgates are open and you'll be seeing masses of Abraxas concept art and world background, followed by more of the Invaders & Ancients books including a never-before-published role-playing scenario. Plus lots more of Russ's amazing art on those and another couple of projects that we've got bubbling away at the back of the Fabled Lands Studio. Less than a week to go now before that all kicks off. 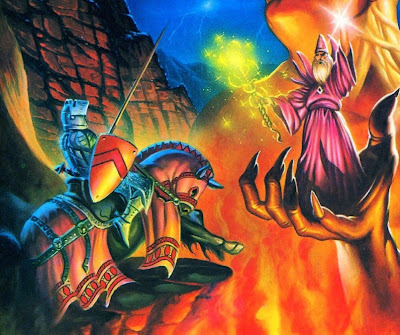 UK radio listeners may have fond memories of a fantasy adventure serial of the 1990s. Did it really feature a young wizard from Dweomer questing across the lands of Sokara and Golnir, you may wonder? Well yes, it did indeed, for that serial was penned by Jamie and told the legend of the creation - and near destruction - of the Fabled Lands. In case you missed it on the radio, we've got the first instalment as an MP3 right here. Be warned, though - it's a 40 Meg download. Here's some more unearthed material from the Invaders & Ancients campaign setting that was to have formed later books in the Dragon Warriors series. The picture above (by Russ, of course) shows the wharf at Tamary, a depot town halfway up the huge River Ophis where intrepid merchants of the two coldly warring civilizations come to trade. The nonhuman there is a habdigar. These creatures are slaves of the Ancients, who without them would have been overrun by the Invader race long ago. The habdigars, unlike the Ancients and the Invaders, are of a completely nonhuman evolutionary branch. They are short but thickly set, with powerful muscles running in bands across their back that give them a hunched appearance. They walk upon two long hind legs, using their shorter forelimbs for carrying objects. They have a snout with upcurving tusks and a vestigial horn. The eyes are forward-looking with multiple nictating membranes which filter light in a range of illumination levels. When these membranes are drawn across they make the habdigar's eyes seem to glitter like pearls. The habdigar's auditory organs are set in bony chambers which form a kind of segmented crest running laterally across the top of its head. 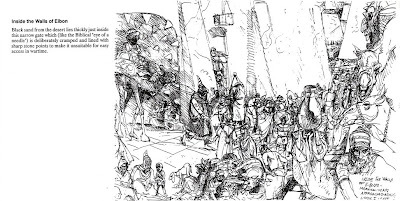 The first of the pictures below is by Iain McCaig and depicts a group of adventurers of the Invader race who have been invited to dine in one of the great houses of Sardonyx, the Ancients' capital. 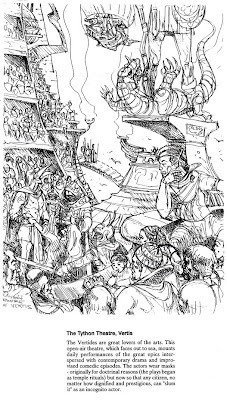 You can see a more polished version of this drawing, and some more of Iain's artwork illustrating the Invaders & Ancients world, in his book Shadowline. Hmm, I only just noticed how appropriate that title is, seeing as how so much of the DW2 material was inspired by the works of Joseph Conrad. Iain's way ahead of me as usual. The four of them ran along a ruined colonnade and out into dazzling sunshine. They were on a terrace overlooking a vast square. Some way to the right, a dark hunched figure was scurrying down a flight of steps. Every so often it would pause to pick its way slowly past a clump of weeds, and then take a long grasshopper jump that carried it half a dozen steps at a time. "It's not human!" said Nephithia. The creature stopped as it reached the square to look back at them. The broken flagstones blazed like polished metal in the sun, making its heavy black features difficult to see. They got an impression of tusks, a bony crest, eyes like black opals. The body was squat, with long backward-flexing legs and small forelimbs. "A habdigar," said Chendu, out of breath as he caught them up. "The Ancients use them as servants." From standing poised like a statue, the creature came back to life and bounded along the side of the square. Its path would take it right below where they were standing. Taltivin bent and put his arms around a block of shattered masonry, raising it above his head with a grunt of effort. He stood with muscles bunched. The veins standing out on his neck made it look like the stump of a strong tree. He sucked in a lungful of air, pulled back, and with a great roar flung the rock into space. The habdigar stopped short at once as it heard the sound, freezing stock still and swiveling its head around. That reflex, which for its ancestors might have been a survival trait, was its undoing. The block of masonry smashed into its shoulders with a muffled crack, pinning it to the ground like a crushed bug. Nephithia grimaced in disgust to see the hideous flurry of its limbs as it jerked over onto its back. The long legs pounded futilely at the air. Its muscles locked rigid as it gave vent to a long agonized howl that ripped through the silence of the Old City. The howl went on and on and then suddenly stopped, like a trumpet blown until it breaks. The habdigar's body lapsed into spasmodic twitching. "Shall I get the body, sir?" asked Taltivin without enthusiasm. His words were all but drowned out. A chorus of howling welled up from every empty window and doorway throughout the derelict buildings across the square. The sound grew, a deafening wave of noise in answer to the dying call of the habdigar that lay squashed on the stones below them. It was not so much terrifying because of any suggestion of danger as for the quality of utter alienness. That strange ululation might not have been a threat, might not even have been a lament for a slain comrade. It came from nonhuman throats, resounded from bony cavities no human skull possessed, had its origin in thoughts and feelings no human could even guess at. 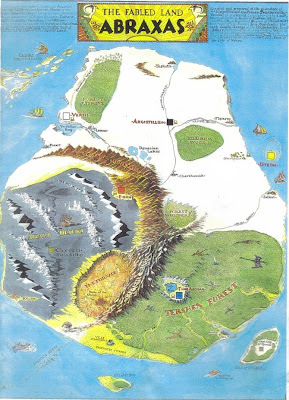 One of the main reasons that Jamie and I are so proud of the Fabled Lands books, and why we think they really achieved our goal of transporting the reader into an immersive fantasy world, is that we had the privilege of working with that maestro of fantastic visualisation, Russ Nicholson. 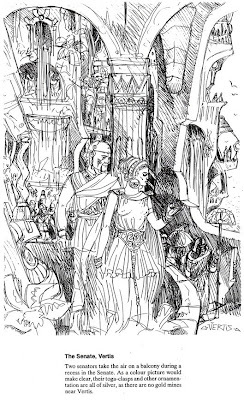 Russ illustrated many other gamebooks too - he illustrated almost all of mine, in fact. But Fabled Lands was unique because we had more time to work closely with Russ at the concepting stage. Not only did he bring his awesome imagination to bear on the work, he was probably the only artist who could have understood what we were trying to do with Fabled Lands. It wasn't just a question of picking a scene and illustrating it. We needed somebody who could evoke an entire world with a varied and authentic range of architectural styles, clothing, imagery and culture. He had to pull off the same kind of effect that, over a decade on, James Cameron was trying to do with Avatar. It needed to be as if a documentary film-maker was showing footage of another universe - only Russ had about one hundred thousandth of Avatar's budget to work with! These pictures are two of my personal favorites. They transcend the specific scene as described in the books to make you feel like you are glimpsing moments in the lives of people who really do inhabit a teeming, breathing world full of sights and smells. And that's a big part of why Fabled Lands has such a devoted following all these years after it first appeared. Because we know that, in our mind's eye, the world persists as a living, breathing fantasy and if we were to drop into it we would encounter a merchant of Conflass or a masked lord of Uttaku as naturally as we walk past the folks at our local Starbucks. Role-playing gamers have a tendency to offend (and I speak as a sometime guilty party) against the laws of reality. Magic? Well, that, obviously. But I'm really thinking of the way players get their model of the world from movies and books. "I swing on the rope, let go and let momentum carry me onto the balcony." Actually, mate, you'd plummet like a sack of flour. The acrobatic skills you're envisaging belong to a cartoon mouse, not a human being. But, okay, maybe that one gets a pass. 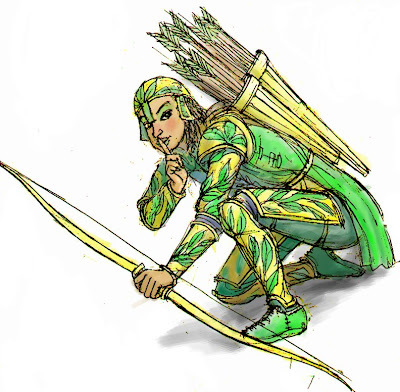 Characters in RPGs are supposed to be adventurers with Olympic-level athletic prowess. But how about the gamers who think they can swim (or indeed do anything other than drown) in full plate armour? Or the guy in one of my games who put a warning shot over his opponent's head with a crossbow, the only effect being to alert him to the fact that the crossbow was no longer loaded? Whether you care about such things in your games is up to you. I happen to think that one of the fun things about role-playing is the way a campaign can spur you to find out the facts about everything from economics to nutrition. And, just like in a novel, having to work around the constraints set by reality leads to the best story outcomes. This is why role-playing stimulates such full and interesting fan activity, with lots of people chipping in with their diverse expertise and helping to flesh out the world. And while I'm on the subject of fandom, incidentally, let me just point you in the direction of Ordo Draconis, the DW fanzine, issue #2 just out; and my own Eye of All-Seeing Wonder, the Tekumel fanzine, available here. Tekumel is one of the very few fantasy worlds that doesn't have horses. 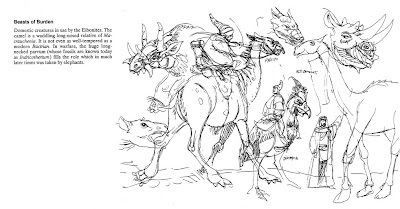 And yet for all the importance of horses in most campaigns, gamers (who typically are more at home in an Aeron chair than a saddle) have little grasp of what the beasties are like. Most seem to think of a horse as being like a kind of all-terrain bike that runs on hay and answers to whistled commands like a sheepdog. My wife Roz, author of the Nail Your Novel creative writing blog, has a horse, and she loses no opportunity to set me and my gaming friends straight on all our equine misconceptions. And now she's gone as far as to write an article on the use of horses in role-playing games. It's over on the Dragon Warriors Wiki. Hi ho, Silver. I've started the long process of sorting through the Invaders & Ancients material that Oliver and I planned to use for Dragon Warriors books 7 onwards. Still feeling a little dazed to find I still have this stuff. It's as though somebody in Hong Kong turned up a videotape of "The Power of the Daleks". Well, maybe not quite in that league, but it involves defiance of similar odds. 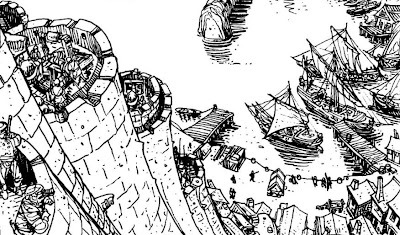 Approaching from the sea or from upriver, the first parts of Deliverance visible to the traveller are the white limestone towers of the New Citadel built on a knoll rising above the intense green foliage of the flats. However, as the bend in the river unfurls a far more imposing sight will meet his eyes on the west bank. Here stand the shattered columns and pylons of the Old City laid to waste five hundred years ago by the first Invaders. It is a scene of melancholy grandeur, apparently devoid of all signs of life apart from one or two strands of smoke rising from the grounds of a villa set high on the hill. Should the traveller inquire who deigns to dwell in such a desolate location he will be met with a blank look and the reply that there live the human followers of Shard, vampire lord of the Old City. At night ghostly lights can be seen around this villa and, if the wind is right, the strains of unearthly music will be heard as the vampires disport themselves. The only other vestige of life in this most dead of all dead places comes on moonless nights, when a barge illuminated by many candles drifts over the river to Deliverance. No-one is visible aboard and the city guards prevent anyone wading out to it, believing that it will convey its load into the heart of the deathly catacombs on the other bank. In contrast, Deliverance is a bedlam of noise and colour. As the traveller's barque glides into the capacious harbour, his eyes will be dazzled by the resplendent crimson sails of the King's fleet, the rich oranges of the hawkers' stalls on the waterfront, and the bales of azure and emerald silks hung at the back of merchants' shops. A pungent rotting odour emanates from the river itself, which is a sewage channel for the whole city, and in the summer a swarm of pestilential flies and nipping insects will descend as soon as the ship loses headway and her sails are furled. In winter the river will be swollen with water and choked with debris it has swept along with it in its thousand mile journey from the hinterland. Rotting animal carcasses and great boughs of trees cause hazards to even the smallest skiff, and the bridge of boats across the harbour market rides nearly as high as the dockland wharves and warehouses. To the south, the shanty town of Keelhaul is awash, with the water lapping at the tops of the stilts on which the houses there are built. The traveller, if curious, will have the major sights pointed out to him. To the south a ruinous mound of blackened stones - which will be lapped by the floodwaters in winter - marks the Krall, or walled enclosure, of Kuruga I. The Krall was the first land to be settled on this bank of the river. Ragged men and women can be seen squatting around the ruins under wretched awnings, obviously the poorest of the poor. A motley collection of warehouses also lie to the south, but hardly comparable to the mighty edifices of the north that house the richer merchants' goods. Further up the tributary river can be seen the city cemetary, where in winter the hills supporting the high marble sarcophagi of the rich townsfolk will look like barques afloat on the icy floodwaters. It will be explained that the commoners prefer cremation from the cathedral tower in the Citadel. 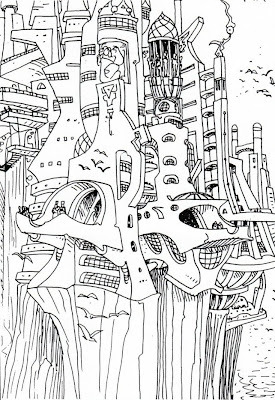 Turning his eyes to the fairer quarter of the city, the traveller will first spy the dominant twin towers of the Citadel: the aforementioned cathedral tower, and what has become known in recent years as the "Bird Tower" after the flocks of birds that wheel around it all year long. It is whispered that the present king, Mukresh the Mad, sits on a throne on top of this tower, feeding the birds with worms while heedless of their droppings which stain his ermine robe. The birds only disperse when the funeral fires are lit atop the cathedral tower. Then they will veer away with a great screeching of protest. This second tower is not as high as the Bird Tower. If the traveller is of worshipful bent, he may know that it is here that St Hanthar's harp is kept, producing an ethereal ululation during nights of high storm. It is thought that this noise is responsible for the way that glasses shatter untouched in taverns on such nights, but others will persuade the newcomer that this is the work of poltergeists - the souls of long-dead Ancients, returning to exact revenge on their conquerers by disrupting their lives and provoking domestic strife. When the traveller disembarks he will be surrounded at once by clamouring hawkers, eager to sell worthless trinkets to the unwary. 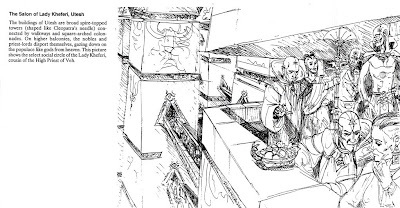 They will grab the hem of his cloak as they jostle for his attention - offering themselves as guides, touting for hostels, waving sickly-looking pastries in front of his face or hefting plump eating-monkeys. At the same time, cutpurses may very well be divesting him of his wealth by more direct means. 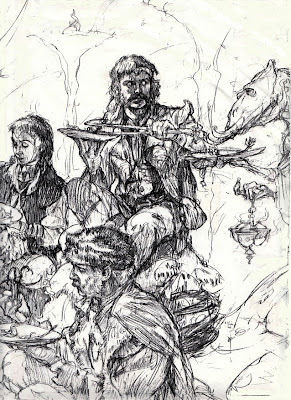 If they are successful, or if he has no wealth to begin with, the traveller may have to opt for the squalor of one of the inns of Bazaar district or (even worse) one of the decaying hostelries in the shanty town. But a more fortunate traveller will install himself in one of the better inns grouped around the base of the Citadel. Unlike the ramshackle wooden constructions to the south, the buildings north of the tributary are on the whole fashioned of limestone, which is quarried from cliffs further up the Ophis river. Particularly impressive is the Cathedral Square. To the east, the Avenue of Victories heads straight to the distant military tower of the Mirdaum Gate and the bleak edifice of the Tower of Jalfrezi the Howler, where lunatics are penned at the King's pleasure. The cathedral itself is constructed of pale grey rock and in its pillared porticoes the ubiquitous street vendors sell religious mementoes and votary candles. Sometimes they are driven off by irate priests, but more often they pay over a share of their profits for a "portico license". Occasionally, devotees of one of the military orders will swagger out and begin a duel in the forecourt; the richly-robed merchants scuttle past attempting to avoid embroilment. Strange sounds assail the traveller's ears as he draws near the Citadel gates. These emanate from the royal menagerie, where a thousand creatures squawk and screech. The gate leading into the Citadel is known because of this as the Monkey Gate - although officially it is named after King Haramba the Munificent, who built it. The western pylon of the gate incorporates the weatherworn features of a colossal statue that stood here in the days of the Ancients. Four others once stood beside it, all now merely visible as tantalising fragments, building blocks of the Citadel wall. Would-be guides will try to drag the sightseer off to the right, into a side street running parallel to the wall where part of a troll's arm (so they claim) can be seen fossilised into the surrounding masonry. 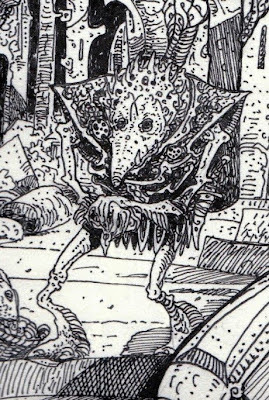 The guides explain that this is one of the trolls who were turned to stone during the erection of the city walls in 45 SC. If the traveller suggests that it may be just another part of one of the colossi he will be answered by a frown and an outreached hand. As far as his guide is concerned, he has been shown a genuine troll's arm; he should now pay a gratuity for being led to this wonderous sight. Returning to the gateway, the traveller will see on either side an array of dirty cages. These are the pens of the menagerie, and from them wafts an agglomerate of animal stenches to assail the traveller's nostrils. Inside the pens, back amid the shadows, one can observe brightly coloured parrots, macaws, shrill peacocks, hemarobia, monkeys, rhinocerotes, iridescent lithocarp beetles, and other spawn of distant lands. In the murky depths of a pool it is just possible to discern the shapes of octopuses, tectevulti and liveried gogo fish. On some days a servant will come to spear one of the animals for a feast. Some guides murmur that the King keeps strange were-beast hybrids in the dungeons of the Bird Tower. Once one escaped and was responsible for a spate of killings, leading to the imposition of a two-day curfew while the King's Guard hunted it down. Our traveller will not be allowed to pass into the massively blocked Citadel, but is free to wander the environs of the inner curtain wall. He will see the elegantly serried steps which lead down to the amphitheatre, around whose perimeter stand crystalline sarcophagi encasing the mummified bodies of great heroes. An inscribed metal plaque in front of each sarcophagus announces the name and lineage of its occupant, but for the deeds that made him great one must attend the doubtless embellished narratives of the guides. 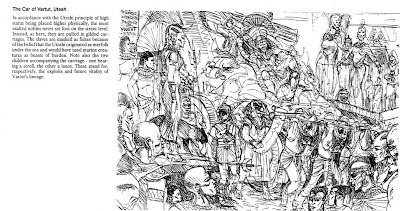 Dressed in antique armour, many with quizzical expressions on their faces, the mummies gaze out over the two hundred metre long stadium. In their sarcophagi they are taken up and paraded through the streets on Foundation Day, when the games are held in the amphitheatre. Some of the crystal sarcophagi, however, are empty - shattered by the mad plangency of Hanthar's harp on stormy nights when the spirit of evil was abroad and the sarcophagus' occupant strode out once more to do battle. The cathedral tower rises up from the middle of the Citadel area, and is frequently surrounded by the funeral parties that have come to cremate their dead. Priests wearing coloured robes stand at its entrance and forbid access to all but fellow priests, initiates and mourners. Many of the other buildings in this area are crumbling with age. A place of special note is the Chapel of Skulls - a low, dimly lit, granite building where the skulls of those nobles slaughtered in Fainel's rebellion of 313 SC are kept for public view. An even smaller building is the Church of Pons Caela. It would seem utterly insignificant if not for the small group of worshippers who file in to view the sacred relic: the bracelet given to Mirendam the Helmsman during the Invaders' "journey through the stars". This legend is now largely discredited, and the church does not improve its image by hiring thugs to collect an extortionate entrance fee from the gullible pilgrims. Many of the tenements here, inhabited in the early history of Deliverance, are ruined and rat infested, their occupants having moved to more salubrious areas once the protection of the Citadel walls was no longer needed. The traveller may stumble across the domicile of a seer or lunatic here, though the area is worth avoiding for that reason. Such men are always unpleasant to strangers. They can be seen to descend to the waterfront plaza late on moonless nights to see the barge drift over from the Old City. Sometimes one swims out to it and is never seen again. As the sun sets, the traveller winds his cloak around him and urges his guide to lead him to a tavern. There are none in the Citadel, and it an extremely bleak and depressing area to be in after dusk. To the east lies the district that has come to be called The Steps, because the plush villas situated here have been built on terraces descending the steep cliffs beneath in Citadel walls. Few of the rich merchants who live in these villas wish to make the arduous climb up to the Citadel, so there are always hordes of palanquin bearers to be seen lolling on the stepped avenue waiting for passengers. Occasional street brawls break out in this area over matters of disputed custom or unpaid fares, but these are rare. Three gangs run the criminal affairs of the city, and most hawkers and litter bearers pay protection money to them. This ensures that everyone knows his place in the street pecking order, and minimises the risk of disputes. A hard-up newcomer may think that an easy penny can be had on the streets of Deliverance, but he will soon find himself mixed up in such underworld affairs if he is not very careful. 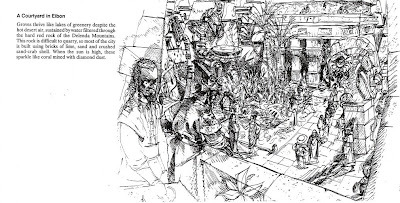 One of the most desperate areas of franchise warfare is, naturally, the Bazaar - a huge area to the east of the town where honest peasants from the surrounding countryside barter furiously with the petty crooks of the city. It is easy for strangers to become lost in the maze of stalls selling everything from turquoise trinkets to scented inks, from ruby dripping jewelery to sides of meat from the nearby abattoir. The area is infested with flies and disease as there is no sanitation; newcomers are frequently struck down by some foul bug after visiting it. The Square of the Great Victory, to the west, is similarly not a place to loiter. It is infested with orators, dissidents and drunks. To the north-east is another area of wharves where the hunters of the surrounding lagoons congregate in their flat-bottomed boats. 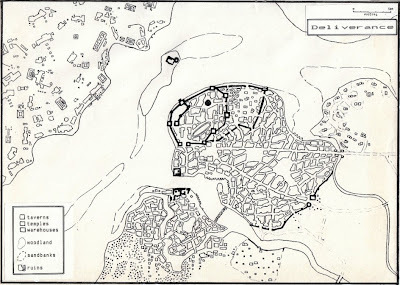 This is the players' overview of the city which is to be their base of operations through most of the first scenario book. Along with the maps, it provides players with their only pre-game information about the city. Anything else they wish to know must be discovered in-character. The Games Master is provided with a number of plot strands currently at work in the city: plots against the King, guild rivalries, rumours, mysterious goings-on, etc. Out of the interaction between these plot strands and the players' actions is woven the game narrative. 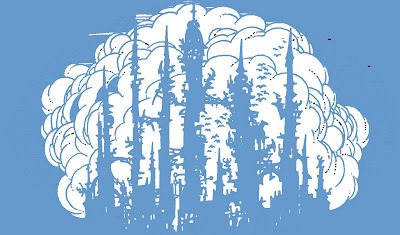 We don't plan on running posts about Edwardian fantasy comic Mirabilis here, firstly because it's got its own website and blog, secondly because it is not one of the properties owned by the Fabled Lands Studio, and thirdly because at the time of writing the project is in darker limbo than the bilges of a Uttakin slave ship. You can get a little bit of the flavor of the thing from "A Wrong Turning", a ghostly strip that Martin McKenna and I originally intended to fit into the same world as the main comic but which is now officially a standalone story and absolutely positively nothing to do with Mirabilis. It's free. Click on the pic to your right, Dwight. I hope that you may help me with my Trouble and do not object to a letter from one as does not know you. I have the agreeable position of regular employment at a public house by the Strand, name of The Three Gypsies. My duties there in the main being the stabling of horses, polishing brasses, & co. I also do in the taprooms and some private bedrooms that are kept for travellers, though not so frequent as in former times, now that the coach stand is not there no more. In the morning I rake out the fires and carry the ashes in a pail, which I have been in the habit of tipping down the drain that is in the street near the entrance to the yard. Only the other morning I went out that way and saw what had the look of two sooty, or I should say ashen, footprints on the pavement outside. Scuffing at these with my foot had no effect to remove them, and thinking no more I went and poured the ashes down the drain as per usual. Then on the next day I found two bare feet standing there. Just the plain feet, you understand, and not with no body above them, the feet being grey and looking to my eye to be made of ashes. Subsequent to that, having visited the drain on my purpose some other times, the feet have now been joined by ankles and the lower part of the legs, that is the calf. Mr Bardley, him being the landlord, says not to be tipping the ashes that way no more, but I have become quite driven with Curiosity to find out what will come. Today I tipped out another pail of ashes and in the morrow I’m in expectation of a pair of knees. Do you gents think this is advisable, or is Mr Bardley right? Dr Clattercut replies: Mr Gammock, I have no direct experience of exactly such a phenomenon as you describe, but I implore you to consider all the ways that it could turn out if you continue as you have. One does not have to be an avid reader of the works of Mr Bram Stoker to foresee something rather chilling. There are many bad endings to the story and few good ones. Prof Bromfield replies: Hmm. You do not say as much in your letter, but I surmise that the pedal extremities in question are feminine, and reasonably shapely. For once I have to agree with Clattercut. If this goes on, Mr Gammock, I feel it could be a case of curiosity killing the cat. As you can see, despite the usual label applied to any fin-de-siècle fantasy, Mirabilis is not steampunk. This is 1901. Motor cars are the latest thing, not steam trains, and anyway it's more pukka than it is punk. 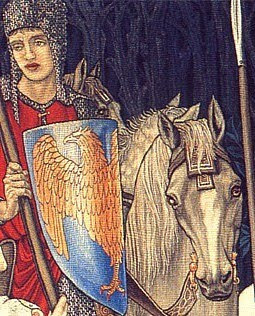 It really belongs to the traditions of English fantasy exemplified by Lord Dunsany, Sidney Sime, A J Alan, John Collier and John Whitbourn - to name a distinguished few. 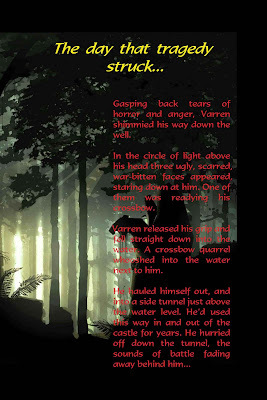 If you like Mr Gammock's tale, there's more in that vein right here. In a couple of days we'll have more updates on the Invaders & Ancients books for Dragon Warriors fans, and if you're waiting for Abraxas then just hold on till March 22 and there'll be a veritable torrent. In the meantime, don't miss out on all the freebies from the Fabled Lands Studio including Billy Graves: Bonesman. Just click on the cover images in the sidebar. One of Russ's character sketches for the Heart of Harkun comic. 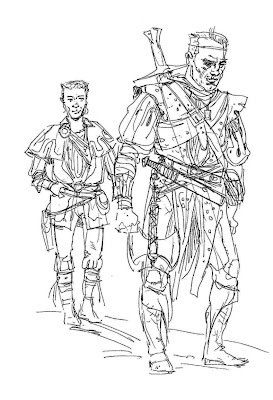 This shows callow but uppity wizard-in-training Arcos trailing along behind Kadar, a once-great warrior who is weighted down by both his past and a bottle. They both have a long way to go on their journey, and I don't mean as measured in miles. Yet another cross-post from the Super Comics Adventure Squad blog today. They may start charging a commission. 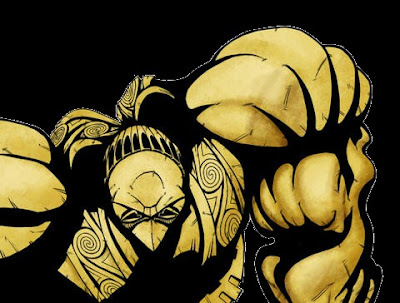 This was New Knights of Camelot, which Leo Hartas and I developed as a comic book. 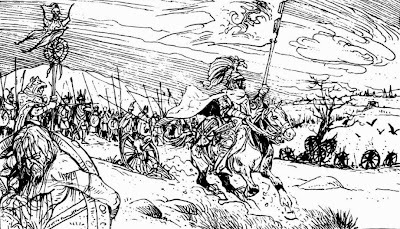 Fifteen minutes after King Arthur's death, Morgana comes looking for the crown - and all that's left to stop her are a bunch of squires and stablehands. Oh, and the ghost of Merlin. 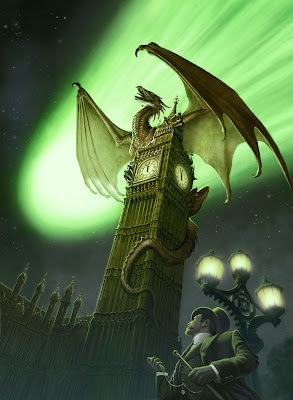 More on the Mirabilis blog.